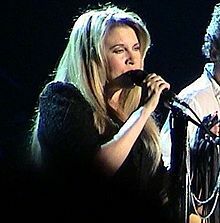 Stephanie Lynn Nicks (born May 26, 1948) is an American singer and songwriter. 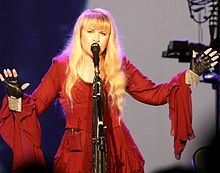 Nicks is best known for her work as a songwriter and vocalist with Fleetwood Mac, and also for her chart-topping solo career. She is known for her distinctive voice, mystical stage persona, and poetic, symbolic lyrics. 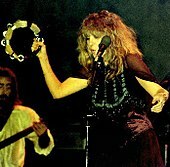 Collectively, her work both as a member of Fleetwood Mac and as a solo artist has produced over 40 top-50 hits and sold over 140 million records, making her one of the best-selling music acts of all time with Fleetwood Mac. Nicks has been named one of the 100 Greatest Songwriters of All Time, and as one of the world's top "100 Greatest Singers of All Time" by Rolling Stone. 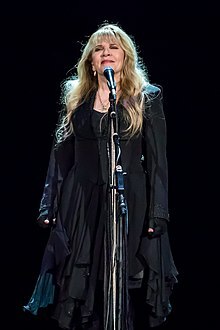 As a member of Fleetwood Mac, she was inducted into the Rock and Roll Hall of Fame in 1998, and will be inducted as a solo artist in 2019; she will become the first woman to ever be inducted twice into the Hall of Fame. She has garnered eight Grammy Award nominations and two American Music Award nominations as a solo artist. 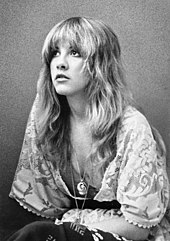 She has won numerous awards with Fleetwood Mac, including a Grammy Award and five Grammy Award nominations. In October 2018, Nicks was one of fifteen artists to be nominated for induction to the Rock and Roll Hall of Fame. On December 13, 2018, she was announced as one of seven inductees to the Rock and Roll Hall of Fame class of 2019. Nicks will make history as the first woman to be inducted twice to the hall. ↑ "1981 Rolling Stone Covers: RS351: Stevie Nicks". Rolling Stone. September 3, 1981. Retrieved October 5, 2011. ↑ "Stevie Nicks in LA Times". Rockalittle.com. October 23, 1997. Retrieved February 18, 2011. ↑ "100 Greatest Songwriters of All Time". Rolling Stone. Retrieved December 2, 2016. ↑ "100 Greatest Singers of All Time, No. 98, Stevie Nicks". Rolling Stone. Retrieved October 31, 2012. ↑ Ben Sisario (December 13, 2018). "Janet Jackson & Radiohead Leads Rock & Roll Hall of Fame Class of 2019". New York Times. Retrieved December 13, 2018. ↑ "Grammy Nomintations [sic]". Ledge. fleetwoodmac.net. June 16, 2008. Retrieved October 5, 2011. 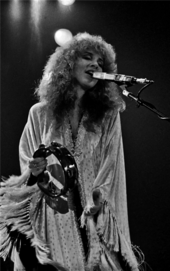 ↑ "American album certifications – Stevie Nicks – Bella Donna". Recording Industry Association of America. If necessary, click Advanced, then click Format, then select Album, then click SEARCH. 1 2 3 Daisann McLane (1980). "Five Not So Easy Pieces". Rolling Stone – Issue 310. Archived from the original on January 16, 2008. Retrieved June 1, 2010. 1 2 Randy Cordova (October 21, 1997). "Oh, Mother! 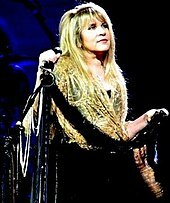 – Fleetwood Mac's Stevie, 49, still Barbara's little girl". Arizona Republic. Retrieved June 1, 2010. ↑ "Stevie Nicks on her Family". inherownwords.com. Retrieved June 1, 2010. ↑ Mike Ragogna (2012). "In Your Dreams Documentary Premieres at Hampton's: Chatting With Stevie Nicks". The Huffington Post. Retrieved July 8, 2013. ↑ "Stevie Nicks Story pg2 - Arcadia High School ROCK Legends". Arcadiaapaches.com. Retrieved November 11, 2016. ↑ Fleetwood, Mick; Bozza, Anthony (2014). Play On: Now, Then and Fleetwood Mac. Hodder & Stoughton. p. 32. ISBN 9781444753264. She briefly had a band called Changing Times, but her musical journey did not really begin until the family moved, yet again, to San Francisco. ↑ "Queen of the Stoned Age". Q. May 2001. Retrieved June 1, 2010. ↑ "Stevie Nicks on Lindsey Buckingham 1". Inherownwords.com. Retrieved 2017-03-03. ↑ "Javier Pacheco Question and Answer Session". fleetwoodmac.net. July 5–24, 1999. Retrieved June 2, 2010. ↑ "Stevie Nicks Biography". fleetwoodmac.net. Retrieved June 2, 2010. 1 2 "Stevie Nicks – Ask Stevie". Rock A Little. Retrieved February 11, 2016. ↑ Fred Schruers (October 30, 1997). "Back on the Chain Gang". Rolling Stone. Retrieved June 2, 2010. ↑ Jackson, Blair (February 1, 2011). "Music: Lindsey Buckingham in Two Worlds". Mix. ↑ "Stevie Nicks – Behind the Music". nicksfix.com. Retrieved June 2, 2010. ↑ Cynthia McFadden (September 7, 2010). "Stevie Nicks in Her Own Words". ABC News. Archived from the original on January 30, 2011. Retrieved September 1, 2014. ↑ Chris Isaak, Stevie Nicks (March 5, 2009). The Chris Isaak Hour (Television). The Biography Channel. Event occurs at 0:37. Retrieved July 26, 2017. ↑ "Stevie Nicks on 'Landslide'". inherownwords.com. Retrieved June 2, 2010. ↑ "Stevie Nicks Tells the Story Behind 'Landslide'". performingsongwriter.com. Retrieved February 3, 2014. ↑ Furman, Leah (2003). Rumours Exposed: The Unauthorized Biography of Fleetwood Mac. Citadel Press. pp. 80–81. ISBN 978-0-8065-2472-6. ↑ "500 Greatest Songs of All Time". Rolling Stone. Retrieved September 30, 2012. ↑ "Stevie Nicks – Behind the Music". Retrieved September 30, 2012. ↑ "Stevie Nicks Wins in a 'Landslide' at BMI Country Awards; Steele Named Songwriter of the Year". November 3, 2002. Retrieved September 30, 2012. ↑ Booth Moore (October 23, 1997). "Airy Godmother". Los Angeles Times. Retrieved June 2, 2010. ↑ Marilyn Dennis (May 6, 2001). "Stevie Nicks Interview". CHUM Radio in Toronto. Retrieved June 2, 2010. ↑ "Stevie Nicks on Lindsey Buckingham". inherownwords.com. Retrieved June 2, 2010. ↑ "Fleetwood Mac – Rumours". timepieces.nl. Retrieved June 2, 2010. ↑ Rooksby, Rikky (2004). Fleetwood Mac: The Complete Guide to their Music (2 ed.). Omnibus Press. p. 59. ISBN 1-84449-427-6. Retrieved June 2, 2010. 1 2 Caillat, Ken; Stiefel, Steve (2012). Making Rumours the inside story of the classic Fleetwood Mac album. Hoboken, N.J.: John Wiley & Sons. pp. 292–294. ISBN 978-1-118-28286-1. Retrieved September 1, 2014. ↑ "Stevie Nicks Interview – Off The Record". nicksfix.com. Retrieved June 2, 2010. ↑ "Fleetwood Mac Timeline for the 1970s". fleetwoodmac-uk.com. Retrieved June 3, 2010. ↑ "UnCut Magazine – Five Go Mad". Retrieved October 14, 2012. ↑ "Fleetwood Mac – The Rumour Mill, Classic Rock, June 2003". Google. February 15, 2004. Retrieved January 9, 2011. ↑ Phil Sutcliffe (December 2003). "Take it to the Limit". Mojo. Retrieved June 3, 2010. ↑ "The Penguin Q&A Sessions: Walter Egan, Section 2". FleetwoodMac.net. October 13–26, 1999. Retrieved January 17, 2015. ↑ Kutner, Rick. "Walter Egan: Not Shy: Review". All-Music Guide. Retrieved January 18, 2015. ↑ "The Penguin Q&A Sessions: Walter Egan, Section 1". FleetwoodMac.net. October 13–26, 1999. Retrieved January 17, 2015. ↑ "Stevie Nicks – Behind the Music". Retrieved June 3, 2010. ↑ "The Tuscaloosa News – Google News Archive Search". Google News. Retrieved October 6, 2014. ↑ "High Times Magazine". Rockalittle.com. Retrieved October 6, 2014. ↑ "roio". Bigozine2.com. Retrieved October 6, 2014. ↑ "Pop: Tom Petty and Heartbreakers in Jersey". The New York Times. Retrieved October 7, 2014. ↑ "Stevie Nicks on her Journal, Prose & Poetry". Inherownwords.com. Retrieved October 6, 2014. ↑ "Bella Donna". AllMusic. Retrieved February 28, 2014. 1 2 "Stevie Nicks on Robin Snyder Anderson". inherownwords.com. Retrieved September 30, 2012. ↑ "Stevie Nicks- A Survivor's Story". The Telegraph. Retrieved September 30, 2012. ↑ McLean, Craig (2011-03-25). "Stevie Nicks: The men, the music, the menopause". The Guardian. ISSN 0261-3077. Retrieved 2017-08-17. ↑ "Stevie Nicks on the Girls: Sharon Celani & Lori Perry-Nicks". Inherownwords.com. Retrieved October 6, 2014. ↑ "Stevie Nicks – Behind the Music". Rockalittle.com. Retrieved October 6, 2014. ↑ "Rock Concert: Fleetwood Mac on 'Mirage' Tour". The New York Times. Retrieved October 7, 2014. ↑ "Stevie Nicks on 'Rock A Little'". inherownwords.com. Retrieved June 2, 2010. ↑ Brown, Mick (September 8, 2007). "Stevie Nicks: a survivor's story". The Daily Telegraph. London. Retrieved June 3, 2010. 1 2 "The Chris Isaak Hour: Stevie Nicks, 2009". ↑ Cynthia McFadden (September 7, 2001). "Stevie Nicks in Her Own Words". ABC News. Retrieved June 3, 2010. ↑ "Stevie Nicks, The Other Side of The Mirror, UK Interview". Retrieved October 14, 2012. ↑ Marilyn Dennis (May 6, 2001). "Toronto Interview". CHUM Radio. Retrieved June 3, 2010. ↑ "Stevie Nicks on 'Rooms on Fire'". inherownwords.com. Retrieved June 2, 2010. ↑ Steve Dougherty, Todd Gold (January 19, 1998). "High Priestess". People. ↑ "benzo.org.uk - Stevie Nicks: "Klonopin - more deadly than coke"". www.benzo.org.uk. Retrieved 2019-02-04. ↑ Brown, Mick (2007-09-07). "Stevie Nicks: a survivor's story". ISSN 0307-1235. Retrieved 2019-02-04. ↑ Steve Pond (February 7, 1991). "Fleetwood Mac, Live at the Great Western Forum, Inglewood, California December 7th, 1990". Rolling Stone. Retrieved June 3, 2010. ↑ "Timeline 1990s". Go Your Own Way. Retrieved June 3, 2010. ↑ "Timespace: The Best of Stevie Nicks by Stevie Nicks". MTV Artists. Retrieved October 6, 2014. ↑ "Fleetwood Mac: 25 Years, The Chain 4 CD box set review". Louder Than War. Retrieved October 6, 2014. ↑ Milk it! : collected musings on the ... – Google Books. Google Books. 2003. ISBN 0-306-81271-1. Retrieved January 9, 2011. ↑ "Stevie Nicks – Goes her own way". US Weekly. Nicksfix.Com. June 11–18, 2001. Retrieved October 5, 2011. ↑ "Stevie Nicks Talks To MSN Music". nicksfix.com. Nicksfix.Com. January 1999. Retrieved February 28, 2014. ↑ Stepko, Barbara (May 25, 2001). "Stevie Wonder". nicksfix.com. nicksfix.com. Retrieved October 17, 2014. ↑ "Whenever I Call You, Friend: Stevie Nicks' Greatest Collaborations " Radio.com". Radio.com. Archived from the original on October 10, 2014. Retrieved October 6, 2014. ↑ ""Party of Five" Soundtrack Due in '96". MTV News. Retrieved October 6, 2014. ↑ "The Blue Letter Archives". Bla.fleetwoodmac.net. Retrieved October 6, 2014. ↑ "Lakeland Ledger – Google News Archive Search". Google News. Retrieved October 6, 2014. ↑ "Gold Dust Woman: A Q&A With Stevie Nicks". American Songwriter. Retrieved October 6, 2014. ↑ "Stevie Nicks interview". Rockalittle.com. Retrieved October 6, 2014. 1 2 "Stevie Nicks: Rock Singer". People. Retrieved October 6, 2014. ↑ "Silver Springs". Rock a Little. Retrieved February 28, 2014. ↑ "Fleetwood Mac". Rockhall.com. Retrieved October 6, 2014. ↑ "Fleetwood Mac". Brit Awards. Archived from the original on May 7, 2014. Retrieved October 6, 2014. ↑ "Stevie Nicks Interview on KLOS". Rockalittle.com. Retrieved October 6, 2014. ↑ "The Blue Letter Archives". Bla.fleetwood.net. Retrieved October 6, 2014. ↑ ""Crystal" Mesh Sheryl Crow and Stevie Nicks invite EW to their first recording session". Entertainment Weekly. Rockalittle.com. Retrieved October 6, 2014. ↑ "Bjork, Joni Mitchell Reign Over Walden Woods Benefit". MTV News. Retrieved October 6, 2014. ↑ "Stevie Nicks – Wall of Sound Interview". Rockalittle.com. Retrieved October 6, 2014. ↑ "Stevie Nicks – Time Out New York Interview". Rockalittle.com. Retrieved October 6, 2014. ↑ "Stevie Nicks". Billboard. February 12, 2001. Retrieved October 6, 2014. ↑ "Dallas Austin Discusses Working With Stevie Nicks". MTV News. Retrieved October 6, 2014. ↑ "Stevie Nicks – Mix 96.9 Interview". Rockalittle.com. Retrieved October 6, 2014. ↑ "Complete List of Grammy Nominees". CBS News. January 4, 2002. Retrieved October 6, 2014. ↑ "Stevie Nicks – PRNewswire". Rockalittle.com. Retrieved October 6, 2014. ↑ "Ep. 043 – Stevie Nicks – Behind The Music – Episode Summary, Highlights, and Recaps". VH1. Retrieved October 6, 2014. ↑ "Bronchitis Knocks Nicks Off Tour". Billboard. August 22, 2001. Retrieved October 6, 2014. ↑ "Many Concerts Cancelled After 9/11 Attacks". Rolling Stone. Retrieved October 6, 2014. ↑ "Reviews for Say You Will by Fleetwood Mac ". Metacritic. Retrieved October 6, 2014. ↑ "Music Review: Fleetwood Mac – Say You Will". Blogcritics. Retrieved October 6, 2014. ↑ Blackman, Guy (February 12, 2006). "A magical life – Music – Entertainment". The Age. Melbourne. Retrieved January 9, 2011. ↑ "Pop DVD: Fleetwood Mac, Destiny Rules – Music". The Guardian. Retrieved October 6, 2014. ↑ "The Blue Letter Archives". Bla.fleetwoodmac.net. Retrieved December 21, 2014. ↑ "McGraw Leads Seven Top 10 Debuts Onto Billboard 200". Billboard. April 4, 2007. Retrieved October 6, 2014. ↑ "Bella Donna -Bella Donna – Casino Connection Atlantic City". Casinoconnectionac.com. Retrieved October 6, 2014. ↑ "Stevie Nicks To Join Chris Isaak on Tour". Paste. Retrieved October 6, 2014. ↑ "Stevie Nicks Is Looking Back, Charging Forward on New Album". Santa Barbara Independent. July 26, 2010. Retrieved October 6, 2014. ↑ "PrideSource – Stevie Nicks talks gays, 'Glee' controversy and losing weight ... with her own music?". Pridesource. Retrieved October 6, 2014. ↑ "Chart Highlights: Rodney Atkins Takes 'Back Road' To No. 1 On Country Songs". Billboard. Retrieved August 9, 2013. ↑ "Stevie Nicks Reveals Inspiration Behind For What It's Worth". CBS. Archived from the original on September 21, 2013. Retrieved September 30, 2012. ↑ "Stevie Nicks 'For What It's Worth' on 'Leno'". Rolling Stone. Retrieved October 6, 2014. ↑ "Stevie Nicks on The X Factor". Tvtonight.com. Retrieved October 6, 2014. ↑ "Stevie Nicks Discusses Her New Album and Performs on 'The Talk' (VIDEO)". The Huffington Post. Retrieved October 6, 2014. ↑ "Stevie Nicks Performs in New York City " Q105". Myq105.cbslocal.com. Retrieved October 6, 2014. ↑ "Rod Stewart and Stevie Nicks announce North American 'Heart and Soul' tour dates". ABC7 Los Angeles. Retrieved October 6, 2014. ↑ "Legendary Ladies of Rock Perform on The Oprah Winfrey Show" WCBS-FM 101.1". Wcbsfm.cbslocal.com. Archived from the original on October 10, 2014. Retrieved October 6, 2014. ↑ "Show Tracker". Retrieved October 6, 2014. ↑ "Beastie Boys Score No. 2 Debut on Billboard 200, Adele Holds at No. 1". Billboard. Retrieved August 9, 2013. ↑ "ARIA Charts Media Release 2011" (PDF). ↑ Semigran, Aly (May 4, 2011). "Fleetwood Mac Teach 'Glee' Kids A Lesson On Rumours". MTV. Retrieved August 29, 2011. ↑ Graff, Gary. "Stevie Nicks Calls New Album 'My Own Little 'Rumours". Billboard. Retrieved August 29, 2011. ↑ Caulfield, Keith. "Beastie Boys Score No. 2 Debut on Billboard 200, Adele Holds at No. 1". Billboard. Retrieved August 29, 2011. ↑ "BUDDY HOLLY Has Great Company on Ganymede". Aliveandwellmovie.com. May 12, 2011. Archived from the original on September 3, 2011. Retrieved October 5, 2011. ↑ "Participants " Listen to Me". True Great Original. Retrieved October 5, 2011. ↑ "Paste Magazine: Stevie Nicks Stays Gold". Retrieved 2017-05-27. ↑ "Nirvana/Paul McCartney collaboration to feature on Dave Grohl's 'Sound City' soundtrack". NME. December 14, 2012. Retrieved December 20, 2012. ↑ "Fleetwood Mac Release 'Extended Play' EP". Rolling Stone. April 30, 2013. Retrieved March 1, 2015. ↑ Dicker, Chris (2016). Stevie Nicks Biography: The Amazing Life of Stevie Nicks and The Inside Rumors About Lindsey Buckingham and Fleetwood Mac. ↑ "Stevie Nicks Talks 'American Horror Story'". Rolling Stone. December 3, 2013. Retrieved December 21, 2013. 1 2 3 Drew, Ian (January 8, 2014). "Stevie Nicks Talks 'American Horror Story'". Us Weekly. Retrieved February 28, 2014. ↑ Seikaly, Andrew (May 14, 2014). "Stevie Nicks Honored by Adam Levine, Shakira, Sheryl Crow at BMI Pop Awards". The Hollywood Reporter. Retrieved August 6, 2014. ↑ "Stevie Nicks joins 'The Voice'". CNN. July 10, 2014. Retrieved August 6, 2014. ↑ "About | Stevie Nicks". Stevienicksofficial.com. Retrieved 2017-04-18. ↑ Pre-Order LIMITED EDITION "Crystal Visions...The Very Best of Stevie Nicks " Double Vinyl. Fleetwood Mac News (April 23, 2015). Retrieved on September 28, 2015. ↑ 08:40 AM (2016-09-06). "STEVIE NICKS ANNOUNCES 27 CITY NORTH AMERICAN 24 KARAT GOLD TOUR WITH PRETENDERS". Stevienicksofficial.com. Retrieved 2017-06-14. ↑ Amy Phillips; Amanda Wicks (2017-04-26). "Lana Del Rey and Stevie Nicks Team Up for New Song on *Lust for Life*". Pitchfork. Retrieved 2017-06-14. ↑ "Dreams Unwind: Lana Del Rey In Conversation With Stevie Nicks". V Magazine. Retrieved June 28, 2017. ↑ "Fans delirious as Stevie Nicks joins Tom Petty on stage". BBC News. Retrieved July 10, 2017. ↑ Interview by Liz Derringer, High Times magazine – March 1982. ↑ "How I Got That Look", Allure magazine, April 1995 Interview. ↑ Transcribed by Jane Fijal, "Spotlight on Stevie Nicks", Aired on 96.1 WSRS Worcester, Massachusetts on August 5, 2001. ↑ On someone who influenced her look, Glamour, December 1981. ↑ "Review: Fleetwood Mac at American Airlines Center". Preston Jones. December 15, 2014. ↑ Joseph Rosenfeld (May 16–22, 2007). "Stevie Nicks: Style Icon". metroactive.com. Archived from the original on October 5, 2007. Retrieved June 3, 2010. 1 2 3 "Stevie's Journal Entries Regarding Visits to the Injured Troops". The Nicks Fix. Retrieved June 3, 2010. ↑ "Still Dressing for Stevie". New York Times. Retrieved July 20, 2015. ↑ "Tax Treatment of Leisure Accoutrements". American Bar Association. Retrieved July 20, 2015. ↑ "Stevie Nicks on Gypsy". In Her Own Words. Retrieved November 15, 2017. ↑ Beyoncé Knowles (August 2, 2009). I Am... Yours: An Intimate Performance at Wynn Las Vegas (DVD). Sony Music. Event occurs at 1:03:50. ISAN ISAN 0000-0002-37DF-0000-A0000-0000-7. 1 2 "Blonde On Blonde". Spin. Rockalittle.com. Retrieved February 1, 2014. ↑ "The Popdose Interview: Belinda Carlisle". Popdose. Retrieved February 1, 2014. ↑ "Stevie Nicks – CMT Interview with Dixie Chicks". Rockalittle.com. Retrieved February 1, 2014. ↑ "iio – Bio – Nadia Ali". People.uleth.ca. August 3, 1980. Archived from the original on November 4, 2014. Retrieved February 28, 2014. ↑ Hodge, Will. (April 25, 2011) Rolling Stone Best of Rock 2011. Rollingstone.com. Retrieved on September 28, 2015. ↑ Magowan, Margot (February 13, 2012). "Taylor Swift sings her way from victim to hero, triumphs at Grammys – City Brights: Margot Magowan". San Francisco Chronicle. Retrieved February 28, 2014. ↑ kater. "Vanessa Carlton Is Like BFF with Stevie Nicks". Idolator. Retrieved February 28, 2014. ↑ "Just friends". Cosmopolitan. May 6, 2013. Retrieved February 28, 2014. ↑ "Stevie Nicks on Lorde: 'She probably would have been the third girl in Fleetwood Mac'". Fuse. May 6, 2013. Retrieved March 28, 2018. ↑ "Stevie Nicks Wins in a 'Landslide' at BMI Country Awards". Broadcast Music Incorporated. November 3, 2003. Retrieved June 3, 2010. ↑ Ditzian, Eric (January 31, 2010). "Taylor Swift Shares The Stage With Stevie Nicks at the Grammys". MTV. Retrieved January 9, 2011. ↑ Stephanie Tuck (March 2002). "Desert Rose". In Style. Retrieved June 3, 2010. 1 2 Brown, Mick (September 8, 2007). ""Stevie Nicks: A Survivor's Story"". The Daily Telegraph. Retrieved July 4, 2014. ↑ "Stevie Nicks: A Magical Life, 2006". The Age. Retrieved February 28, 2014. ↑ Holly-George Warren. "Stevie Nicks on Loss, Love, and What She Wears". More. Archived from the original on February 21, 2014. Retrieved February 3, 2014. ↑ "Stevie Nicks interview — Access Hollywood". YouTube. Retrieved October 17, 2014. ↑ "Stevie Nicks Tells Lindsay Lohan To 'Stand Back' About Playing Her in Movie". omg! news on Yahoo!. April 10, 2009. Archived from the original on April 14, 2009. Retrieved June 3, 2010. ↑ "Stevie Nicks: Lindsay Lohan will 'never' get to play me in a movie 'unless she cleans up her life'". NY Daily News. New York. March 6, 2011. Retrieved September 17, 2011. ↑ "The Insider: Stevie Nicks sells home in Paradise Valley". Phoenix Business Journal. January 2008. Retrieved September 16, 2013. ↑ Madeleine Davies. "Queen Witch Stevie Nicks Officiated a Wedding This Weekend". jezebel.com. Retrieved December 30, 2013. ↑ "Stevie Nicks on Witches Angels and Magick". www.inherownwords.com. ↑ By Sharon Krum, Women's Weekly, December 2005. ↑ "The 2006 Stevie Shows". fmlegacy.com. Archived from the original on May 10, 2009. Retrieved June 3, 2010. ↑ Liz Smith, 'HULAWEEN' SUCCESS – New York Post, November 2, 2006. ↑ "Rod Stewart & Stevie Nicks Announce The Heart & Soul 2011 North American Tour". Archived from the original on 2012-07-09. ↑ "2011-2012 In Your Dreams Tour – Stevie Nicks". Retrieved 2019-02-04. ↑ "2011-2012 In Your Dreams Tour – Stevie Nicks". Retrieved 2019-02-01.